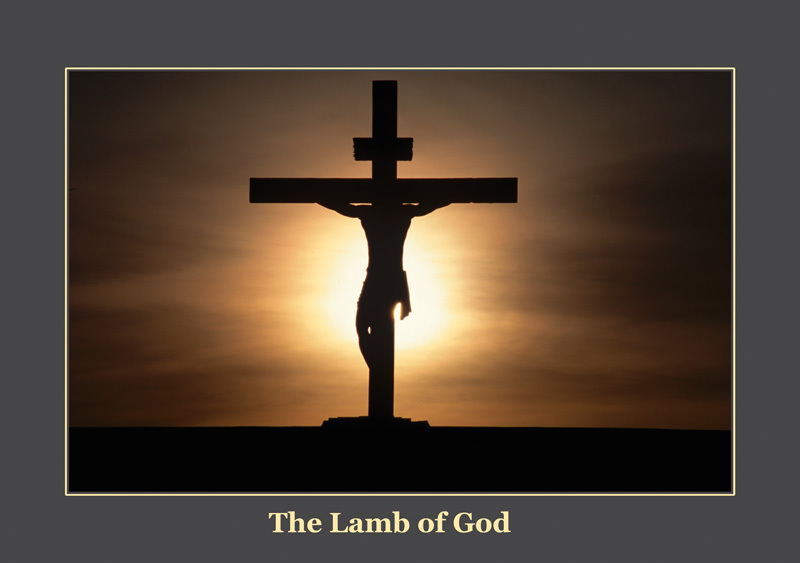 s you will see in the very powerful verses I will be listing in this article – Jesus Christ, and His sacrificial death on the cross, is the central and most important fundamental, basic tenet of the Christian faith. Jesus Christ is God’s only plan of eternal salvation for the entire world. The Bible specifically says, without any other possible interpretation, that there is only one God, one faith, one baptism and one way to God the Father – and that is only through His Son Jesus Christ and His sacrificial death on the cross. Jesus says that He, and only He, is the way, the truth and the life leading to God the Father and that no one comes to the Father except through Him! Many people, including some Christians, believe that God the Father honors all other religions as long as people try to live a good and godly life and try to stay out of trouble. However, as you will see in the Scripture verses I will list below, this is not the way God the Father has everything set up. God will not honor any other religion, and He makes it very clear that it is only through His Son and His sacrificial death on the cross that will give people eternal salvation and thus eternal life with Him in heaven. Below are some of the main verses from Scripture that will deal with the basics of our salvation through Jesus Christ. These verses are the basic ammunition that you will need when witnessing to anyone. Please note the extreme power and authority on the first four verses listed below. These first four verses specifically tell us, without any other possible interpretation, that Jesus Christ is the only way to be able to receive eternal salvation with God the Father. I do not see any other interpretation as to what these verses are trying to tell us other than Jesus Christ is the only way to God the Father and His dwelling place, heaven! I don’t think God the Father could have made things any more clearer than by the way He has worded all of the above Scripture verses! Jesus Himself said in the New Testament that He did not come to bring peace – but division! What He means by this is that He is drawing a major battle line in the sand. You either believe in Him and everything that He stands for – or you do not. There are no middle or neutral grounds on this issue. If you choose not to believe in Jesus and His message of eternal salvation through His death on the cross, then you will die in your sins and go straight to hell when you die – no if, ands or buts about it! The life that we are living down here on this earth is serious business! The choices that we make in this life will determine our ultimate fate in the afterlife. Choose Jesus and the blood that He has personally shed for you on the cross – and you will become saved and born again – and you will then enter into the most incredible place imaginable when you die – heaven itself! God has given each man and each woman a free will to make their own choices in this life. The next 3 verses will show us that God does not want anyone to perish, but that He will not make or force anyone to accept Him and His Son and what His Son’s death on the cross really means for all of us. Notice that God is wanting all men and all women to accept His free gift of eternal salvation through His Son Jesus Christ. He is not making any exceptions either by race, color, creed or gender. The gift of eternal salvation is a free gift given by God to all those who will believe on Jesus and what His death on the cross really means for all of us. These next 3 verses will specifically tell us that good works will not get us into heaven. Works are needed after salvation. The Bible specifically tells us in that last verse that all men and all women have sinned and have fallen way short of the glory of our God. The Bible says that there are none that are righteous before the eyes of God the Father. As a result, none of our fleshly works, no matter how good we think they may be, will ever be good enough to get us into heaven or back into the good graces of our Lord and Savior. Once you become saved and born again by accepting Jesus as your personal Lord and Savior, the Bible says that we are now made perfectly righteous before the eyes of God. The righteousness of Jesus has now been imputed to us. This means that we are now free to approach the throne of God for intimate prayer and communication, and when we die, we will all go straight to heaven. Even though we will continue to commit sin from time to time, God will always forgive us as long as we properly confess each sin when it does happen. We will never become totally sinless or perfect. No one will ever become the fourth person of the Holy Trinity. Only God, Jesus and the Holy Spirit are totally perfect in Their actual natures and in all of Their ways. Humans and angels are not! The Bible says that all men have sinned and will continue to sin, and thus will fall way short of the glory of our God. That is why Jesus had to come and die for all of our sins – which will include all of the past sins that we have ever committed, all of the present sins we are now committing, and all of the future sins that we will ever commit. As a result of Jesus dying on the cross for all of our sins, God the Father now sees all of us as righteous and justified before His very eyes – now and for all of eternity, even though we are all still sinners! Talk about an incredible pardon! So not only do we get a full pardon and a full remission for all of our sins, but we now get to be made perfectly righteous before God the Father Himself. Righteousness and Redemption – what more could we ask for! Notice the last verse says to confess with your mouth, and with the mouth confession is made to receive salvation. This means just saying a good, basic salvation prayer out loud direct to God the Father from your heart. Below is a good, basic salvation prayer to give to someone who wants to get saved by accepting Jesus as his personal Lord and Savior. Some people call this the “Sinners Prayer.” Others call it a basic salvation prayer. Either title will work. Say the following prayer out loud, believe it from your heart and you will be saved. I now believe that Jesus Christ is Your only begotten Son, that He came to our earth in the flesh and died on the cross to take away all of my sins and the sins of this world. I believe that Jesus Christ then rose from the dead on the third day to give all of us eternal life. I now confess to You all of the wrong and sinful things I have ever done in my life. I ask that You please forgive Me and wash away all of my sins by the blood that You have personally shed for me on the cross. I believe that you died and rose from the grave. I am now ready to accept You as my personal Lord and Savior. I now ask that You come into my life and live with Me for all of eternity. You are now saved! It’s that simple! Wasn’t that easy? For more information on the above Sinner’s Prayer, we have another article in our site in the Prayer section titled “The Sinner’s Prayer.” In this article, we give you some additional information as to what goes on behind the scenes in the spiritual realm when God does start to move in on someone in an effort to try and get them saved. To lead someone into eternal salvation through Jesus Christ is really a work of the Holy Spirit. I will show you how God the Father will set people up, and why every Christian needs to be open and sensitive to letting God, through the Holy Spirit, direct you as to who you should witness to and exactly how to go about it. Now that your are saved, God wants you to become a fisherman for Him. All of the above Scripture verses will give you major, live, ammunition to use when trying to get someone saved. The Holy Spirit will really move on someone if you stay with His leadings as to when to witness to that someone and exactly how to go about it. According to the Bible, the greatest thing we can accomplish in this life is to get another person saved and brought home to the Lord – because with the gift of eternal salvation comes the gift of eternal life – which means that when we die, we will be able to enter into heaven to be with God, Jesus, the Holy Spirit, all of Their angels and all of our saved loved ones who have passed away and are now living in heaven. To bring a person into that reality after they die is the greatest thing you can do for another human being! It is the ultimate superman scenario. You are literally saving their eternal life. I do not believe there is any other accomplishment that will bring about as much fulfillment as this one act will do. I will leave you with 16 good verses from the Bible showing you the extreme importance on God being able to use each and every one of us to get other people saved in this life. Unfortunately there is not one example of the “sinner’s prayer” being used in the Bible. Why is that? Did God forget to put it in? Hello Bible Boy, the sinners prayer is only an example to be used as a guideline for those whom want to be saved but are not sure on the direction of the prayer. Romans 10:9 gives us clear instructions on what specifically what to pray for. There is not a “sinners prayer” in the bible, however, the instructions are very clear-confess with your mouth and believe in your heart the Lord Jesus you WILL BE SAVED. Our good works, however, clothe us in Heaven. Acts 2:38 REpent and be baptized everyone of you in the Name of Jesus Christ for the remission of sins and you shall receive the gift of the Holy Ghost! What !! shock, horror ? we have to repent of sins ? But hasn’t the Law been done away with , nailed to the Cross & all of that jazz ? in Luke ^6:46 ” And why do you call me Lord ! Lord ! and do not the things that I say ? “” Many are called to the eternal truths, but few make the correct choices. The narrow Gate to Paradise is only travested by the obedient. Time is eating away at your opportunity.. Stop being a pseudo christian and get serious. The Lord is on His way. Will you be worthy to stand at His appearing ? denounce apostacy, Gazzah . You need to learn the difference between laws, statutes and ordinances.